Timotej Zupan drives his pickup truck through narrow roads up and down the hills on the way to his farm in Slovenian Istria, where he and Orjiana Hrvasti produce Timor olive oil. Small patches of olive groves alternate with forests of oaks and beeches, still without leaves in early spring, dotted with white blossoming almond and prune trees. This pleasant landscape of rolling hills and deep valleys that meet the sea is home of a centuries-long olive oil production tradition and some Slovenian oils rank among the best in the world. Slovenia has an annual olive oil production of just 400 tons, according to the International Olive Council. This is a small figure if compared with neighboring Croatia, which produces around 4,000 tons every year, Italy, with more than 185,000 or Spain, the biggest world producer, with more than 1.5 million tons. “Why Timor?,” I ask Timotej and Orjana, guessing that it may mean something in Slovenian or that maybe they are related in some way to Timor, the Southeast Asian island. Most of the olive trees along the 47-kilometer-long stretch of Slovenian coast grow in narrow terraces excavated in the steep slopes of the hills. Timor’s six olive groves are small and disperse, each containing just a few dozens of olive trees. While some of the plots are by the coast, others are a few kilometers inland. This is not unusual in this part of Slovenia –- as Orjana points out — where large estates are almost non-existent after generations of dividing the properties among family members so that they can be inherited. This fragmentation combined with the rugged terrain makes it hard for machinery to access the olive groves. Thus, old ways of farming endure. As Timotej parks in one of their olive groves, Orjana argues that this apparent disadvantage is key to understand the high quality of their product. “Timotej takes care of the land and then all the family harvests the olives by hand. That improves the quality of the oil because the olives don’t suffer any harm. They reach the mill almost untouched,” she says. 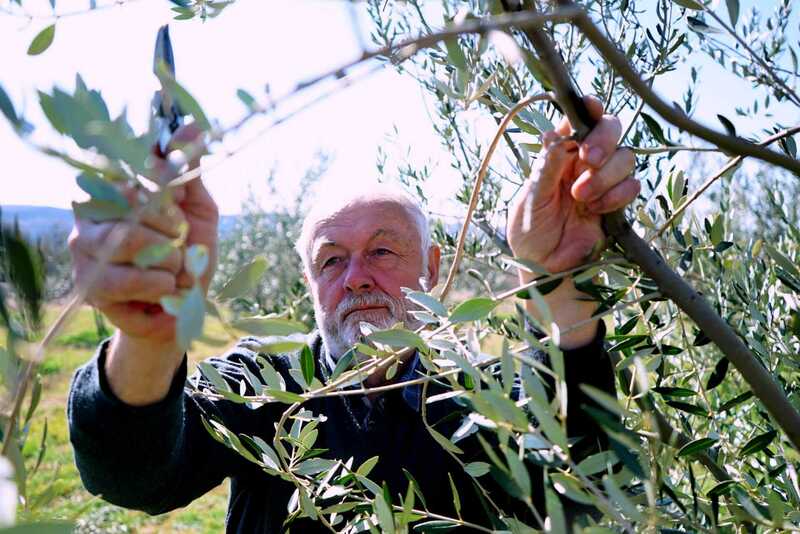 “Also, having such small olive groves allows us to harvest one after the other. If one olive grove is at sea level, then olives ripe first. Those that are inland ripe later. This way we can harvest each of them on the right moment,” she adds. Timor’s olive grove, a mix of young and older trees, is surrounded by woods and some groups of violets sprinkle the grass. As we walk along the terraces, it looks bigger than expected. “Half of it belongs to our cousin,” Orjana clarifies while explaining that the plot is southwest oriented. “This is the most common orientation in this region. It’s a way of protecting the olive trees from low temperatures and frost,” Orjana says. The Slovenian coast in the Northern Adriatic is one of the northernmost olive oil producing areas in the Mediterranean. Here, olive trees cannot grow far from the coast. Only a few kilometers inland is too cold for them. In one of the terraces, among the olive trees, there is a small hut. “Here is where we keep our oil,” Orjana tells. Inside, there’s a cozy place with a full kitchen and a fireplace which looks more like a country cottage than the storage, bottling and labeling plant of an award-winning oil. It’s both things at the same time, though. By the kitchen, there is a garage-like room where Timor’s annual production of around 1,000 liters is stored. Timotej handles with expert hands a pump the size of a kettle which he uses to fill the bottles with oil. Then he shows how he manually applies Timor’s brand labels, using a purpose-built desk to keep the bottle stable. “Like this, I can do around 100 bottles per hour,” he laughs. 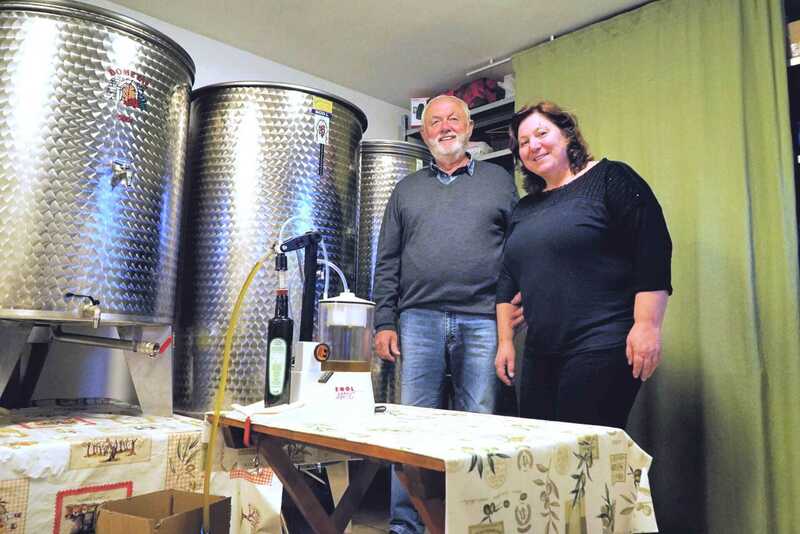 Making a living just from olive oil is unusual in Slovenia and for many producers. It is rather a complement to their “main jobs.” For others, it’s just a matter of self-consumption. “Olive oil is our passion, but it is not our profession. He is a lawyer and I am a general practitioner,” Orjana says. However, her family has produced olive oil for generations. Before World War II, they had their own mill, but it was abandoned as many members of the family moved to cities in Slovenia and Italy. Then, by the mid-80s, her father started planting new olive trees and recovering the old ones. It is a job that Timotej continued when he retired and moved back to his hometown and when, as he puts it, he fell in love with growing olive trees. Nowadays, Timor has around 800 olive trees. In 2018, they won a gold award for their organic medium blend at the NYIOOC World Olive Oil Competition. “It’s all changed a lot in recent years. Before we used to harvest in November or later. Now, we follow the advice of the Institute for Oliveculture in Koper (a nearby town) and we harvest earlier. Of course, the quality of the oil is better now,” Orjana explains.